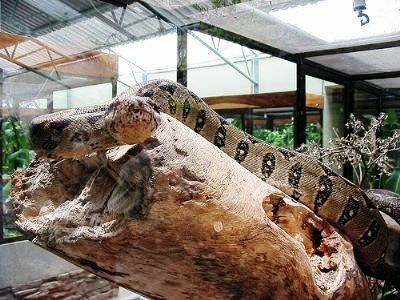 Skytrek Monteverde Herpetarium - discover a world of snakes, basillsks, turtles and frogs on a guided tour in Monteverde Costa Rica. The tours are about one hour long, accompanied by a bilingual nature guide who will tell you surprising facts about the amphibians and reptiles that exist in Monteverde and in Costa Rica in general. Each terrarium has been specially designed for each of the species. There is an interactive room to learn more about herpetology and an exhibition area to see sea snakes, dried skin and more. Enjoy the range of frogs that can be spotted with the help of your guide, the tiny colorful frogs are pretty amazing! The tour is one of the few tours that are held indoors (great if it is raining!) and a fun activity to do in the evening. If you would like a guide it is best to reserve this in advance. The guide is free but if not arranged in advance they may well be busy.